He built a few for a friend of mine and I will have them at Dayton. Hit me up directly and I'll see if we have a few to spare. 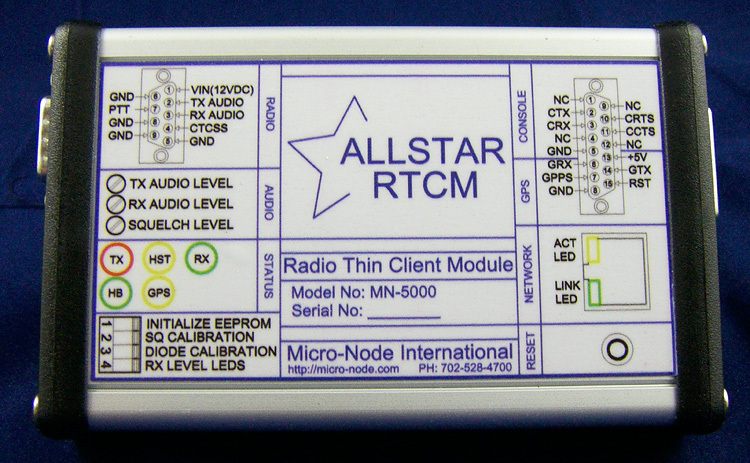 > The PCGM used to be manufactured by micro-node.com which came with an enclosure similar to the RTCM http://micro-node.com/_img/rtcm1-750.jpg but smaller. > Mark at micro-node.com said he was thinking of building another batch (25 or so) of PCGMs as he is seeing some demand. >> I have searched for documentation on the PCGM. can you point me to the enclosure? >>> The one it comes with. >>>> I wonder what kind of enclosure he had it in? >>>>> The PCGM were noisy. I know of a case where a ham using one was shut down by the site owner. Seems the PCGM was emitting a interfering signal on high band, around 158 Mhz. >>>>>> I've been following this with some interest. One of the fundamental issues with the PCGM was the master clock going to the radio was unable to be modulated. This made low frequency signals (PL) distort, and digital PL was even worse. >>>>>> Typically most radios use two point modulation, with modulation on the reference oscillator. When you add an external reference you loose this. >>>>>> Some base stations are designed to do two point modulation even on an external clock, the Quantar for example. This station will even phase lock it's PL and DPL generation if                           provided a 1 PPS in addition to a clock. >>>>>> If we could inject modulation into the clock generator simulcast performance would vastly improve. I'd be interested to see your design to see if this would be a possibility. >>>>>>> I got a page with a pic of a man that rotated  around saying DOWNLOAD NOT FOUND. >>>>>>> I am very interrested in all this project. My email is VE2PF @ VE2MRC dot com! >>>>>>> what radio did you used for the project? >>>>>>> Why not consider do it as an article for Repeater Builder? >>>>>>> I wanted to throw this email out to the group for all those who want to simulcast with the RTCM. For those who don't know, in order to make the RTCM suitable for simulcast you must have a more accurate 9.6 MHz clock for the RTCM in order to ensure the audio sounds acceptable in the overlap areas. I did this a few months ago using 9.6 MHz OCXO's. This worked reasonably well. Not as well as I would have liked but the system was                                                       very usable, but of course I wanted it to be better. Since the PCGM (Programmable Clock Generation Module) is no longer available, I decided to roll my own as some say. >>>>>>> I created a PLL circuit that can accept a 10 MHz, 1 MHz or 100 KHz reference input and produce a phase locked 9.6 MHz out for the RTCM. I have been testing this over the past few days and it has made an great improvement in the audio quality in the overlap. The quality of the audio in the overlap areas sounds very, very good, it's very similar to what I expect to hear in commercial simulcast systems. My circuit is heavily based off of an old Motorola MSF5000 HSO PLL circuit that I was able to adapt and modify to my needs. There are other uses for this circuit that make it attractive for simulcasting but I wont get into them here. I am will to share my schematic and bill of materials (digikey) with anyone. Please send me an email and I will be willing to share all of my information on the project. >>>>>>> To unsubscribe from this list please visit http://lists.allstarlink.org/c gi-bin/mailman/listinfo/app_rp t-users and scroll down to the bottom of the page. Enter your email address and press the "Unsubscribe or edit options button"
>>>>>>> To unsubscribe from this list please visit http://lists.allstarlink.org/cgi-bin/mailman/listinfo/app_rpt-users and scroll down to the bottom of the page. Enter your email address and press the "Unsubscribe or edit options button"
>>>>>> To unsubscribe from this list please visit http://lists.allstarlink.org/cgi-bin/mailman/listinfo/app_rpt-users and scroll down to the bottom of the page. Enter your email address and press the "Unsubscribe or                       edit options button"
>>>> _______________________________________________ App_rpt-users mailing list App_rpt-users at lists.allstarlink.org http://lists.allstarlink.org/cgi-bin/mailman/listinfo/app_rpt-users To unsubscribe from this list please visit http://lists.allstarlink.org/cgi-bin/mailman/listinfo/app_rpt-users and scroll down to the bottom of the page. Enter your email address and press the "Unsubscribe or edit options button" You do not need a password to unsubscribe, you can do it via email confirmation. If you have trouble unsubscribing, please send a message to the list detailing the problem.